Improving road safety is now a large part of Auckland Transport’s plans with $700 million to be invested over the next decade in a bid to reduce deaths and serious injuries on Auckland’s roads. AT’s safety programme includes improvements to rural roads, town centres, such as Glen Eden, the City Centre as well as area wide improvements in residential areas. The first of these to be consulted on is in Te Atatu South – they plan to do Rosehill in Papakura soon too. AT is seeking feedback on its proposal, which includes installing speed tables, speed humps and raised intersections. The area is southwest of the Northwestern Motorway, bounded by Te Atatū and Edmonton Roads to the south, and Central Park Drive and Henderson Creek to the west. The project is part of AT’s commitment to reducing death and serious injuries on our roads by 60 per cent in the next 10 years. Randhir Karma, AT’s Group Manager Network Management and Safety, says the proposal will improve road safety for everyone. “We want to make our residential streets safer for everyone, whether they walk, ride bikes or motorcycles, or drive,” he says. 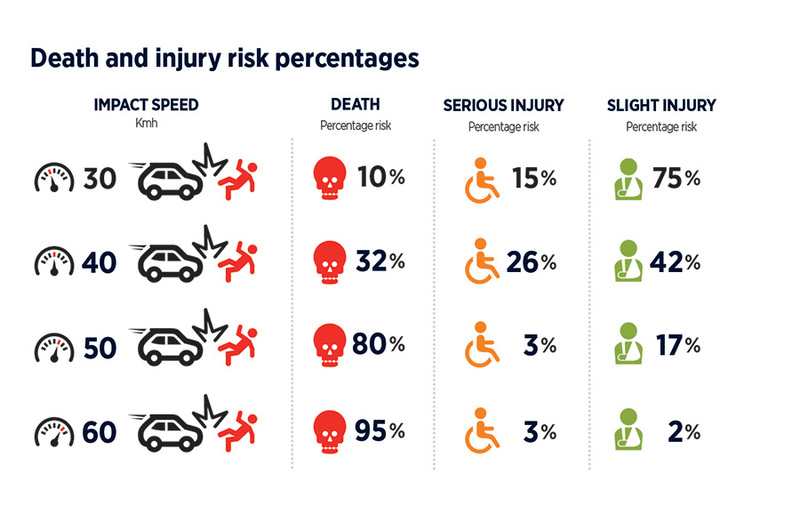 “If a person is hit by a vehicle travelling at 50km/h, the risk of death is 80 per cent. 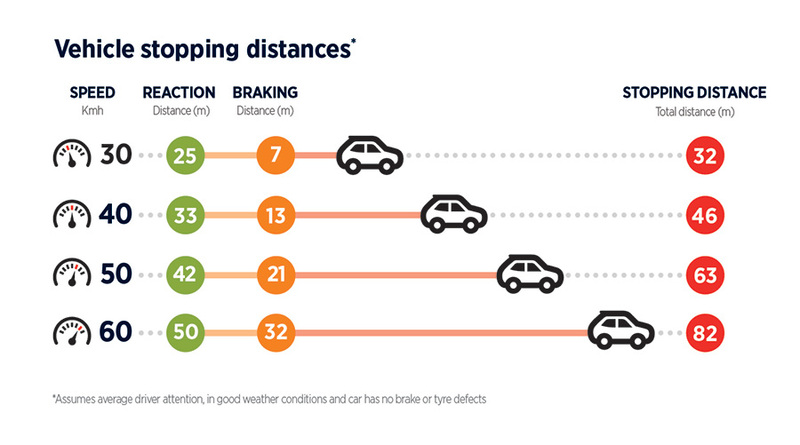 If they are hit at 30km/h, that risk reduces to 10 per cent. We want to create a slower speed environment in Te Atatū South based on what our analysis of local crash data and vehicle speeds is telling us, the number of schools, parks and shops in the area, and safety concerns from residents,” he says. Feedback on the proposal will help to confirm the locations of traffic calming measures, including speed tables and humps. Construction is expected to be complete in mid-2019. AT say there have been 31 crashes in the area and that the fastest speeds recorded have been in excess of 121km/h on School Road and Flanshaw Road. Overall this is good to see, especially that what is proposed is fairly comprehensive and not just a few speed limit signs. But like with Glen Eden, we do think some of the treatments could be better. The table is good but just how effective it will be will depend on how steep the ramps are. I know of some installed recently that are basically flat and so don’t do what they’re intended to do. Then there’s still that large radius curve for cars to swing around. Our friend Cornelius has pulled this image together showing a potential improvement to further slow cars exiting the side street. Perhaps the extra space could have some planter boxes even. Going further, if the goal is about making it easier for pedestrians to cross, how about this version. 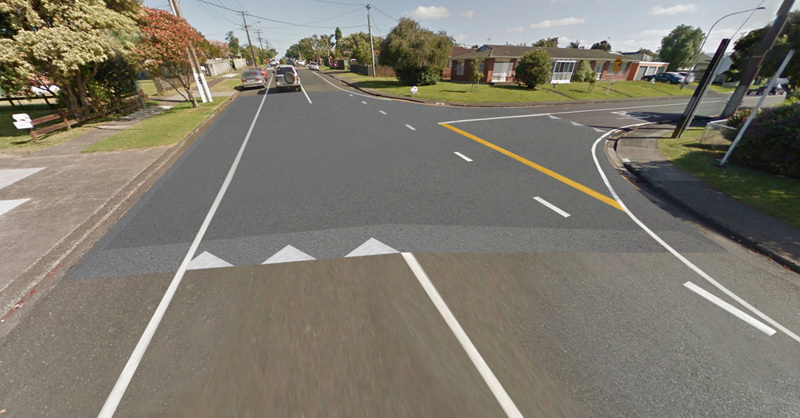 Entry into the area off Central Park Dr, Edmonton Rd or Te Atatu Rd will have a red patch painted on the road as the first visual cue “that they are entering a slow speed area and they must proceed with more caution”. This is good but why not go a step further by adding raised tables to the entry. This would be the same as they’ve done on the side roads off Ponsonby Rd and has really helped improve the pedestrian environment. The treatments primarily consist of creating vertical change to slow traffic with speed humps and tables. It would be good to see some other options included in the mix too, such as blocking some streets to through traffic or mixing in horizontal change by narrowing some sections to a single lane with build-outs. Those build-outs could be planted too, helping to add street trees to an area that has very few of them. One thing I am liking is how AT are improving their comms about this process. I really like the term ‘Survivable Speeds’ and highlighting some of the key evidence behind why this is needed, such as below. Their website even uses the phrase “We can’t outrun physics” which I think is a good way of putting it. The consultation on Te Atatu South is open until Sunday 18 November and there’s an open day in a few weeks for those interested. Location: Te Atatu South Community Centre, 247 Edmonton Road, Te Atatu South. 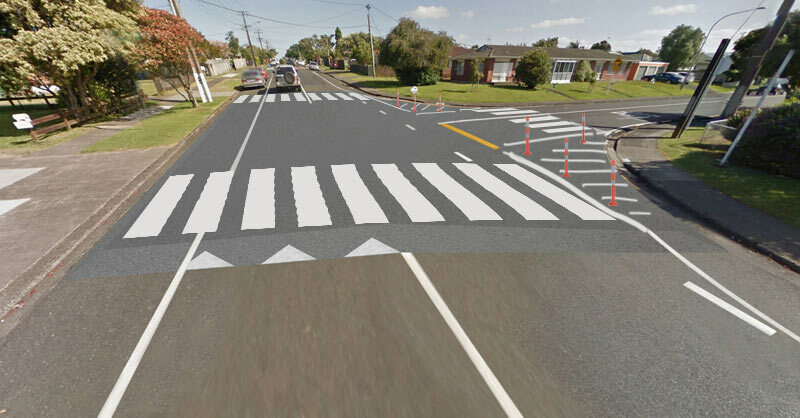 This new “area-wide” traffic calming approach by AT is a result of them putting up $4million over the next couple of years to trial the approach which we pioneered in Balmoral in 2014 – there is a similar project to Te Atatu being planned/consulted in Manurewa. The red thresholds have been used in Albert-Eden to define the boundary of an extensive low speed zone (i.e. were the driver leaves the arterial roads to enter the low speed zone) with minimal requirement for internal features (humps, tables, mini-roundabouts, chicanes, etc.). Even though they are not raised, the effect has been a drop in the 85th percentile speed of about 20% – i.e. from above the speed limit to the low 40s or even high 30s (it varies from street to street but we had 10 locations tested for before and after speed data to verify the outcome). The raised speed tables at side streets along Ponsonby Road is appropriate because of their high pedestrian numbers – not sure how effective in the middle of suburbia. Graeme, you once mentioned the red entry ones in Pt Chevalier. Do you mean at the ends of the Bird Streets? If so, don’t forget that we have a speed problem there. I imagine any drop in speeds was temporary. What those roads need is to be blocked as rat runs, and made into dead ends, with good cycling and walking permeability. Thanks for your work over the years in bringing safer streets to area of Albert Eden. Unfortunately the vulnerable user crash stats now for the board area are pretty bad. It’s clear that the measures that worked temporarily need to be replaced with something much more fundamental. And a lot of that has to do with the traffic that has been induced throughout the board area due to NZTA and AT’s road building programme. Graeme, if it is the Bird Street treatments you mean, perhaps the bricks need sandblasting, if that could return them to a red colour? Monitored before and after, it’d have to be one of the cheapest ways to see if the treatment has an effect in today’s heavy traffic environment. The red thresholds (and a raised table) have been used around Tawa Rd/Rawhiti Rd in One Tree Hill. It has improved things some, it will be interesting to see if this is maintained. As a counterpoint, the chicanes in Te Kawa are basically just chicanes and seldom slow cars down – they just make them look a lot more impressive going along what is otherwise a straight piece of road at 50kmh. Classic situation where a lowered speed limit is required, and that traffic calming measures alone are insufficient. Since people believe that speeding means going over the speed limit rather than understanding that speeding means going faster than is safe and suitable for the conditions, they think it’s ok to go at 50, despite the chicanes. Hallelujah that slower speed limits will actually be coming. Great improvements suggested by Cornelius. I also question the horizontal vs vertical deflection. Why are AT only using vertical deflection here? Isn’t horizontal deflection the preferred best practice? Correct me if I’m wrong. Of course, there are good and bad ways to do horizontal deflection. I thought it was best practice to insert pedestrian refuges between paired bus stops in a tail-to-tail arrangement? The proposed works don’t even acknowledge the presence of bus stops in Flanshaw St and Royal View Road. Looking at them in Google, the bus stops haven’t been touched in years – poles in grass berms, poorly located, no safe crossing points to the rear of them. In fact the proposal text doesn’t seem to mention bus users at all – who are after all pedestrians for the first and last leg. Area road safety treatments should deal with all the issues, not just what is being considered here. Anyone know if this request happened (only 2 months left), and where the pilot programme pedestrian crossings are going in? AT Metro is part of AT so I don’t think they can say no, surely? +1 Also, the time for pedestrian refuges has gone. We need pedestrian crossings, and we need a culture change around stopping at them. First up, being to remove all ‘courtesy crossings’ with the “pedestrians must give way to traffic” signs. Those devices have done such harm. I guess the only reason for looking at the RSBIR commitments is that while AT are still saying that they’ve adopted them in full and without question is to point out the many on 2018’s list that haven’t happened. They can’t fail to do things and get away with saying they’re doing them. Not to mention we should review giveaways rules for pedestrians crossing in corners. These changes are really needed in this area as they are used as rat runs to the motorway and the speeds some people get up to are ridiculous. Agree with a lot of the stuff mentioned in the post that it doesn’t go far enough to make it a better pedestrian environment with trees and raised pedestrian crossings. Also not sure if all the humps allow for cyclists to go down the sides of them? This area in the future will only get more dangerous with more cars parking on the streets obscuring views so its essential to get all these things right now. Hopefully with 2 primary schools nearby more kids will be able to once more venture safely on their bikes. Agree. There’s also a cheap and fundamentally superior technique to prevent the ratrunning and the high speeds. AT needs to block them so that cyclists and pedestrians can get through, but not cars. Often it’ll prevent stupid speeds because the length of the street doesn’t allow them; certainly it’ll keep the through traffic on the main arterials. A few speed humps here and there will not make pedestrians feel like they have top priority nor make cyclists feel they’re on the same footing as drivers. Yes very true. Lowering the speed limit through here I feel is a big step forward though. Lowering the speed limits will be great. It means that those who want to drive more slowly, can. The road codes says they can, but the public have been trained by NZTA and the Police to think that the speed limit is a target, not a limit. Because some drivers drive more slowly, others will follow suit willingly. And yet others will be forced to do so – and NZTA research shows that frustration about having to drive more slowly leads to better safer decisions even while the drivers THINK they’re driving less safely. All in all, it’ll create an environment where people will start walking and cycling more. And therefore won’t be dropping kids at school, etc, vastly reducing traffic volumes. Just like the research says. We need these lowered speed limits across the city. Lowering speed limits is great if it really means, lowering speed limits. For example, shared streets have been an absolute debacle. Elliot St started with a 10kph sign and as a regular user I thought that I could walk safely, because any cars entering the street would be proceeding slowly. The sign disappeared, but I had no reason to believe that the street was anything other than 10kph. What we actually have now is the worst of all worlds: people like myself believing it is a very slow speed area, and therefore safe, and other parts of the population believing that it is 50kph, (which it transpires it actually is) and in many cases driving to that limit. Behaviour like this by AT is nothing short of reckless. A lot of time the speeding in side streets is due to young drivers who try to get attention by speeding with a old unsafe car, and turning up music real loud. That made worse in areas with lower social economic status due to lower self esteem and unloved childhood experiences. In those case, improved viability and warning sign will not help. The most effective way will be an aggressive raised tables and blocked through-traffic on some streets, hidden police car also helps. Regarding the so-called “bird streets” in SE Pt. Chevalier (a 67Ha area bounded by Meola, Pt. Chevalier & Great North Roads). This LATM scheme was built about 20 years ago and the pink brick pavers which were so effective when first installed (giving the same 20% speed reduction) lead us to cancel the rest of the scheme (lots of speed humps and a few mini-roundabouts) and use the saving to move on to other suburbs. Unfortunately 20 years of road grime have dulled the pink pavers to a dull brown barely distinguishable from the tar seal road surface – I tried for 7 years to get AT to water-blast or replace the pavers but their consistent and bizarre response has been that it is not their responsibility to maintain such assets (despite all the resource poured into maintaining every other class of road assets). However as a consolation, when the Premier Avenue threshold developed a pot hole they agreed to renew the entire threshold, replacing all the interlocking pavers with a slightly raised (i.e. 50mm) poured concrete threshold – which is similar in appearance/effectiveness to the original and likely to last considerably longer. But still no progress on the other 9 thresholds – though there is some hope that half of them can be (will be?) re-instated as part of the cycleway works next year – should that happen the Local Board might pick up the tab for completing the job. As a rough rule of thumb a threshold treatment costs of the order of $15,000. As to other comments about modifying the road network (i.e. 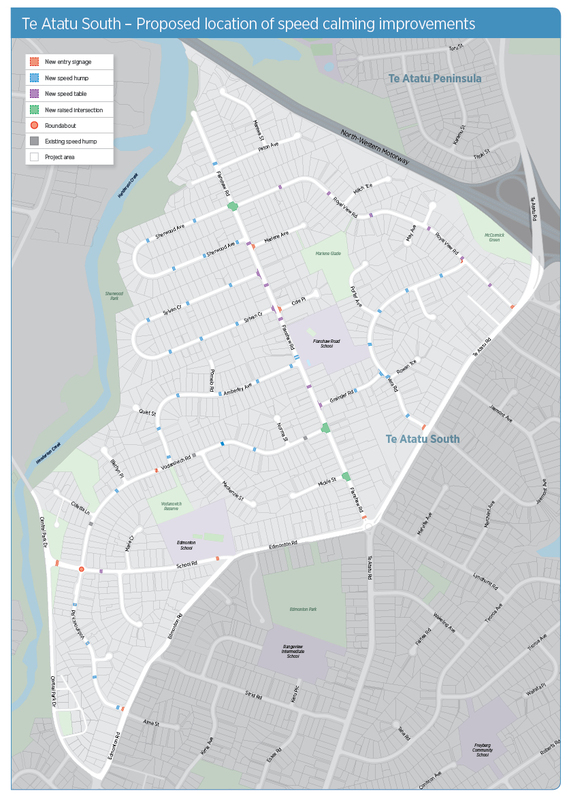 closing some streets or filling in missing connections) – this is beyond the current budget which is intended to cover four such area-wide projects across the region but may only be enough for three if the first two (Te Atatu and Manurewa) become more expensive than anticipated. This is the conundrum that traffic calming programs have faced in many cities – do we go for something affordable that can be spread across many suburbs or go for higher-priced solutions that slow the program down? Thanks for that, Graeme. Good to know the history. Bizarre stuff about maintenance pops up frequently. Blocking with a planter box is considered a cheap treatment, internationally. If that’s too expensive, we’re lost. If we’re after value-for-money, and we should be, according to the GPS, default speed limit changes are the way to go. Not having to treat the entrances to small areas saves money. The culture change means the enforcement is easier. Lots of good international examples … might write a post about it. We mustn’t hold back from trying for the best. And sometimes it’s the cheapest. 1/ Why only half of Freemans Bay? What about the other half that justifies retaining the 50kph limit. 2/ Why 40kph? The adjacent CBD is scheduled to be reduced to 30kph and now it appears Te Atatu South the same speed. Having differing speed limits seemingly randomly allocated , for basically equivalent road hazard conditions in the same city is absurd. What is needed is a lowered default speed limit for all urban roads in Auckland, or preferably, the entire country, unless signposted otherwise. Any speed limit higher then the default should only be imposed after a comprehensive safety assessment shows that the higher speed does not elevate the risks above the adjacent roads, and should be at least annually reassessed against accident data. I would advocate for this default speed limit to be 30kph. Lives are at stake and it is time for the Government to step up. It is good to see though, that with Government inaction that AT has at least commenced very very tentatively to lower Auckland speed limits. A lot more though is needed to make our roads safer, and for them to better perform their total community making potential. Agree with those questions. What’s the project called, Don? I can’t see in on the AT website. Programme is called: Safe Speed Programme: Freemans Bay. 2.) Goddam that makes me mad that they exclude the pedestrian route to Freemans Bay Primary School. The school is the primary school zoned for the inner city. The main practical pedestrian route to the school crosses Nelson St, Union St, then over the Wellington Street overpass and down Wellington Street. Wellington Street currently has one of those better-than-nothing-but-still-mostly-useless variable speed zones that runs at 40km/h during the peak drop-off and pick-up half-hours. There is also a playcentre and a half-dozen ECEs on or off Wellington Street. How hard would it be to extend the 40km/h zone along Wellington Street and related side-streets. I’ve been gently bothering AT about this pedestrian route for a while now. Clearly I need to step my bothering up and do some more strategic work. Thanks for pointing it out, Anthony. Sounds like the school community and the playcehtre and ECE’s should be submitting. So the AT page says that the Freemans Bay project is at the consultation stage, but no matter what I click on, I can’t get to a submission form. There’s simply a couple of sentences, and a map of the streets involved. My sister is in the area, but she’s received nothing in her letter box. Don, Anthony, anyone, when do submissions close? Can you link the actual online submission form? Thanks. Can anyone who has read the draft Transport Design Manual comment on whether the TDM would specify the sole use of vertical deflection in this project? Seems to me it’s bargain basement stuff and entirely inequitable when we’re spending billions of dollars inducing more traffic with more roads. A step up this but yes horizontal maybe more effective than vertical. Great idea but doesn’t fix the rat running problem. AT need to get bold and propose cutting a street with filtered permeability. In fact, this should be the very first thing to happen. I’d start with Grainger Road. Approach the residents and propose it as a trial using temporary measures (aka NYC) with the opening as a street party in Grainger Road. Then start collecting data on the rest of the streets. +1. Or Vera Rd and Royal View Rd, each cut somewhere in the block next to Te Atatu Rd. Anecdotally, less would enter at Vera Rd. Vodanavich, Flandhaw and Royal Rds are the main entry and exit points. Flanshaw – Royal View is the bus route. These roads have speed issues so suffer not only from rat running but also excessive speed so need additional solutions to that problem. Rat running is #1 problem though. It’s an ideal suburb for doing these sorts of blocks. I’d forgotten about the bus route – eventually you could use one of those tidy bus activated bollards, but that’d cost money. A block would cost very little. I’ve seen a great design for self-wicking planter boxes made from IBC containers which could then have a shell built around them from repurposed timber, incorporating some seats. I’d say $3000 would be generous to cover the cost. By being self-wicking, the time between waterings can be quite long, so it wouldn’t be onerous for community groups to care for them. Some West Auckland bloke asked by the Herald reckons this is a conspiracy to raise petrol tax revenue – his car doesn’t hit top gear until 50kph. The part where cars are not efficient at that speed is true. But it is quite unusual to drive on local streets for kilometres. In our congested environment, cars spread out and speed up between congestion hot spots. Limiting the speed they go at in these stretches doesn’t mean they get through the next congestion hotspot any later, often. Instead it just means less acceleration and braking, increasing efficiency. The AT speeds page is good, but I suggest they change the titles on the schematic about chances of death, serious injury and slight injury. Injuries that aren’t classified as “serious injury” are not necessarily slight. Some of them leave people in pain and visiting multiple health professionals for years, or with stitches across their heads and faces that leave scars that never go. These aren’t “slight” injuries. How about just “other injury”? We have asked for a footpath on our street as there is none currently. We are in titirangi. The street has a high and increasing volume of walkers, runners and cyclists. the street is also used by motorists as fast shortcut from scenic drive to Glen eden. Our experience has been AT is not interested in helping with safety improvements. Speed bumps and slowing to 30 km zone also a good option and probably less costly than footpaths. How do residents get council to act when confronted with a wall of inertia? It is actually a dangerous situation requiring action before someone is run over. With the Rahui on the ranges more investment needs to be made in the local working networks including on scenic drive. A safe Scenic walk anybody ? Edmonton Road is congested all day now, with big 18 wheeler trucks going up and down all the time along with a continuous stream of cars. Edmonton Road should be widened as there are alot of pedestrians and school children walking along Edmonton road . The road has not been changed since the 1960s and something should be done about it with the growing population. Such as widening it, making the footpaths wider and no big trucks should be allowed to drive on the road , they should go via Te Atatu Road or Lincoln Road. Edmonton Rd does seem to be excluded from improvements altogether, doesn’t it? Reducing the size of trucks allowed through there is a good idea. Slowing them down would also add to safety. But as for widening the road – that doesn’t improve things for pedestrians and children. 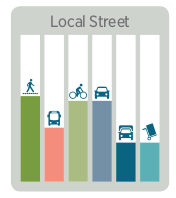 How often do AT widen roads through property purchase to provide extra pedestrian space? And the grass is important as both green infrastructure and pedestrian spillover space, so they shouldn’t use that. In fact, the lanes can be narrowed quite a bit on Edmonton Rd, to provide more space for the active people. With a growing population, the important thing is modeshift to healthier and more space-efficient modes. Here, buses need some sort of priority over the cars to help the modeshift. There are some ways AT could do that along there, but I’d doubt they’re interested in this project. So, that leaves a need for safer streets with lower speeds and improved cycling and walking amenity to encourage these modes. Research shows that lower speeds are an effective way of increasing walking or cycling rates and that traffic volumes are reduced through this. The current pedestrian refuges on Edmonton Rd are insufficient. They are not wide enough for someone pushing a pram with a small child on a trike or bike beside them. They also don’t work for kids trying to cross a steady stream of traffic. And it’s 850 m between safe crossing infrastructure, then 630m. That doesn’t meet anyone’s best practice guidelines. So I’d submit that you need lower speeds on Edmonton Rd, and safe pedestrian infrastructure (speed humps followed by raised tables with real pedestrian crossings on them).